Q. How do I find dissertations or capstones by chair? 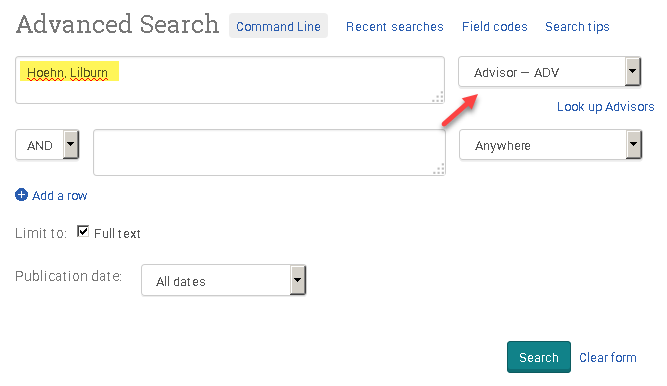 You can find dissertations or capstones with a specific chair by searching for the chair's name and using the Advisor — ADV drop-down option in the Walden-only version of the ProQuest Dissertations database. Note: In the ProQuest Dissertations database, the chair of the dissertation committee is referred to as the advisor. 3. You should now be on the Advanced Search page with three rows of search boxes. Note: If you only have one search box on your screen, click on the Advanced Search link above the search box. 6. To confirm the chair, click the Abstract/Details link for each dissertation and scroll down until you see the Advisor and Committee member information. How do I find Walden Ph.D. dissertations? How do I find Walden D.B.A. doctoral studies? How do I find Walden DNP projects? How do I find Walden Ed.D. project studies?